Yes, you can whip up a design for a printed circuit board, send it out to one of the many fab houses, and receive a finished, completed board in a week or two. There are quick-turn assembly houses that will manufacture a circuit board and populate it for you. But sometimes you need a board now, and that’s when we get into home PCB fabrication. You can do this with either etching or milling, but [Renzo] has a great solution. 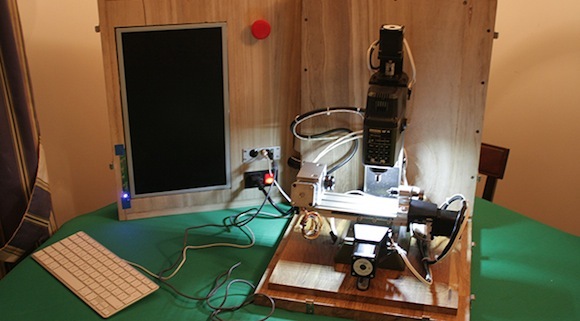 He built a 3D printed milling machine that will make a printed circuit board. The design of this tiny micro mill is based on a handheld rotary tool, also called a Dremel, but that’s like Kleenex, so just buy a Proxxon. This mill is designed with 3D printed T-track and constructed with linear bearings on smooth rods with standard NEMA 17 stepper motors and herringbone gears for little to no backlash. There is quite a bit going on here, but lucky for us [Renzo] has a video tutorial of the entire build process available for viewing below. We’ve previously seen some of [Renzo]’s previous efforts in homemade PCB fabrication, up to and including applying green soldermask with the help of Fritzing. This is good, very good, and the only thing that really separates this from manufactured PCBs is the lack of plated through holes. That’s just a bit of graphite and electroplating away, and we’re looking forward to [Renzo]’s further adventures in making PCBs at home. If you’re working with small parts, even the smallest table saw available at Home Depot or Lowes is generally overkill. For cutting up small pieces of wood, metal, and copper-clad board, a micro table saw is a great investment. They’re actually pretty inexpensive, but why just buy one when you can make one that is better than any model on the market? The bed is constructed out of 1/4″ aluminum plate with a 1/15 horsepower motor bolted to the underside. The fence clamps on to the table with a pair of delrin brackets, while the angle guide is made of delrin and a brass bar that fits into a slot in the table. The actual blades came from a Proxxon micro table saw (a very good brand from our experience), but comparing this homemade saw to the commercial one provides a few surprises: The Proxxon has a more powerful motor, but the homebrew version has four times the cutting capacity. You can check out this saw cutting a 1/4″ aluminum bar in the video after the break. Thanks [Hubert] for sending this one in. Second only to a lathe, a mill is one of the most useful tools to have in a shop. For [juppiter], though, a proper multi-ton mill would take up too much space and be a considerable investment. His solution to his space problem is actually very clever: he converted a small, inexpensive benchtop mill to CNC control, and put everything in a nice box that can be tucked away easily (Italian, here’s the translation). The mill [juppiter] chose for the conversion was a Proxxon MF70, a very small mill made for jewelers and modelers. After buying a CNC conversion kit that included a few NEMA 17 motors, bearings, and mounting plates, [juppiter] set to work on driving these motors and controlling them with a computer. For the stepper drivers, a few industrial motor drivers were sourced on eBay, driven by an i3 miniITX computer built into the mill’s box. Control is through a touchscreen LCD and a Bluetooth keyboard and mouse. So far, [juppiter] has crafted a very elegant wood and brass CNC controller that allows him to jog the axes around and set the home position. It’s an excellent build that really shows off the power and ability of these inexpensive desktop mills.